Fire, Fear, Mortis and Death, the Dark Judges. Death’s costume is a warped version of the standard Judge outfit, instead of the Eagle on the right shoulder Death sports an un-dead Pterosaur. To begin with I made a simple tester shoulder plate out of cardboard to get the dimensions right, and to make sure the thing was not going to take my eye out while moving my arms around. 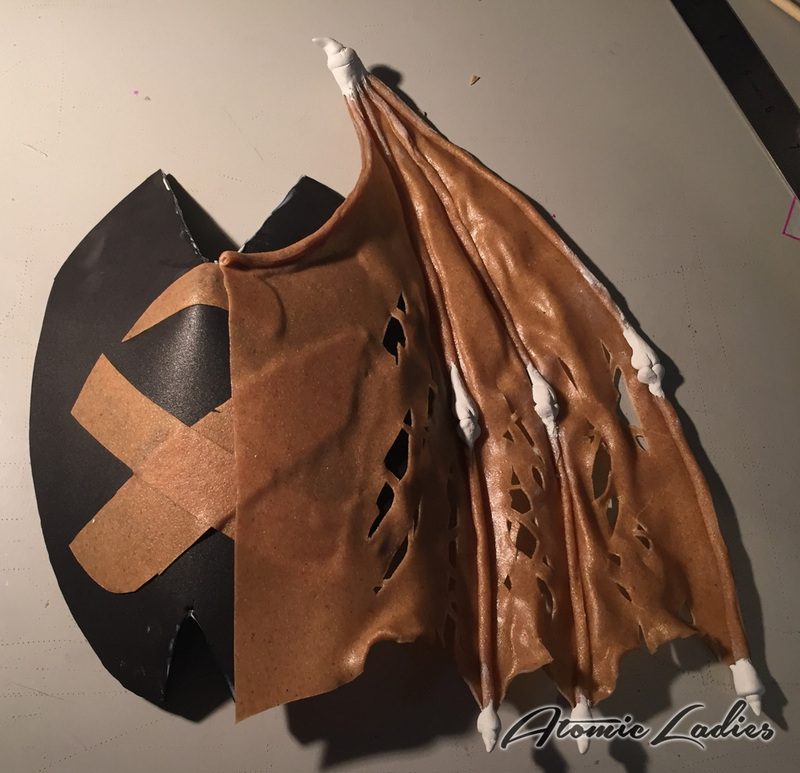 Once I had a good size estimate I re-made it with EVA foam, which would serve as the base that the Pterosaur was attached to. The wings were the first element to be attached to the base. 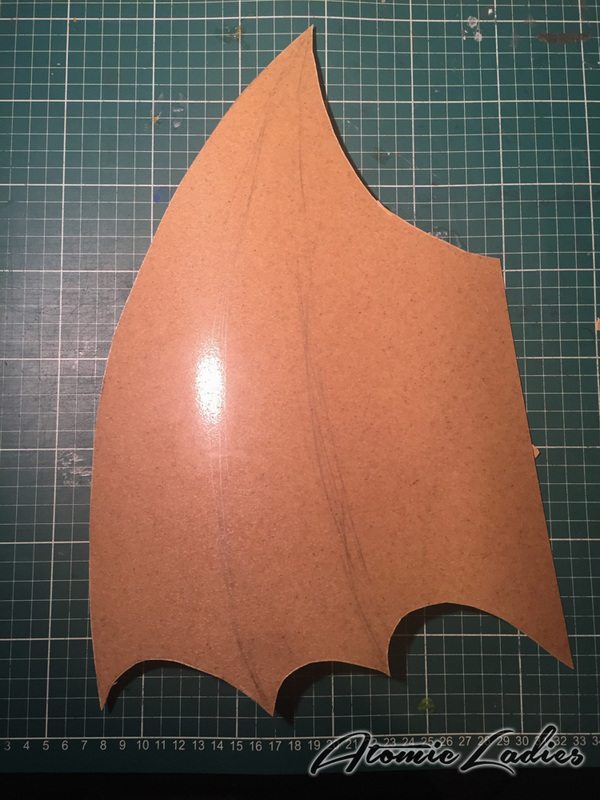 I drew out one wing on the Worbla board, cut it out, flipped it and traced out the other wing. 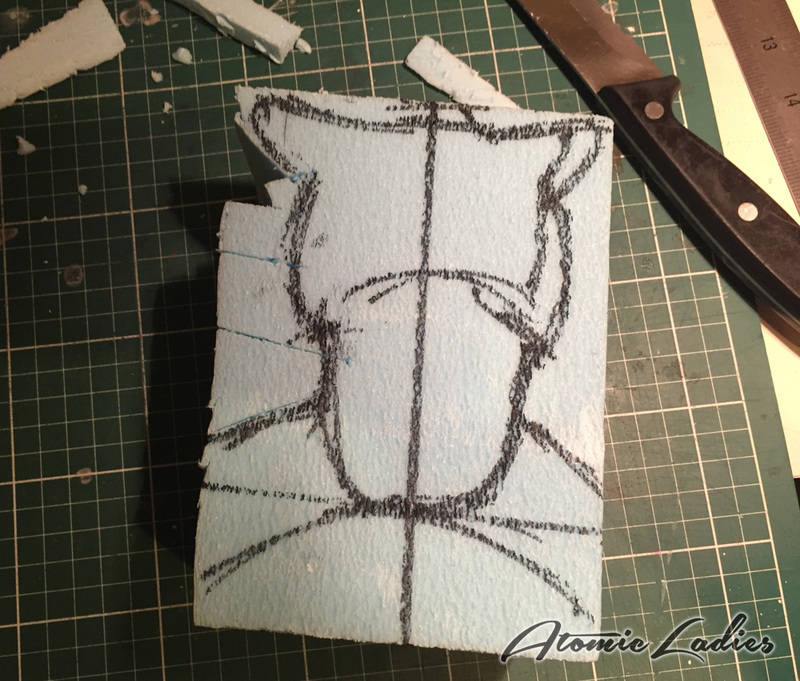 I used a heat gun on the Worbla and began the shaping and cutting process. 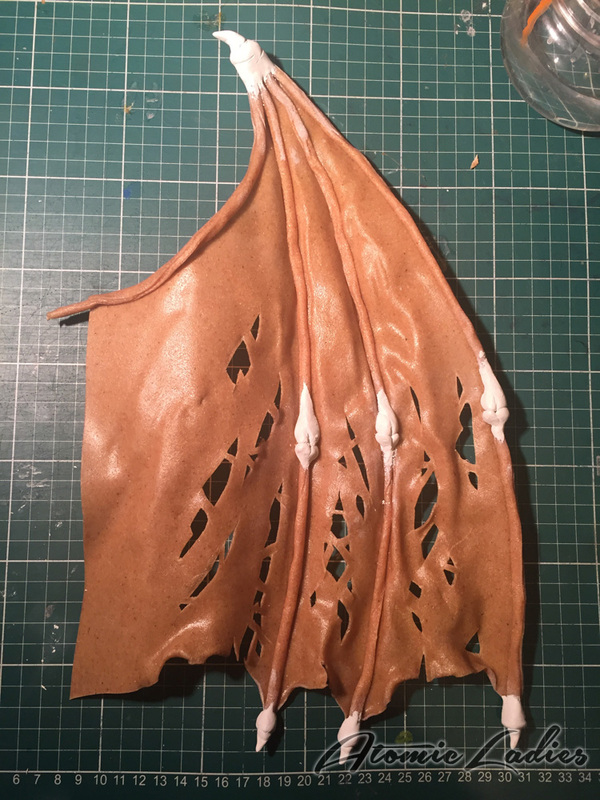 The more you heat Worbla the more malleable it becomes; from being able to bend it, to floppy and finally to particle mush. Each of these stages has a use, but just be mindful to only apply enough heat to get your the desired result. Also, be aware of which side the heat activated glue is on. For this build, I had the glue side forward so I could to attach extra parts later on. To make the bone-fingers I cut out some long rectangle pieces, heated them up, and rolled them into tubes with the glue side up. By heating both the wing and the tubes together I was able to shape and stick the fingers into place, cutting them to size if necessary. More heat was applied to the wing as I shaped the wing sections. A craft knife was used to cut holes and weather the wings. 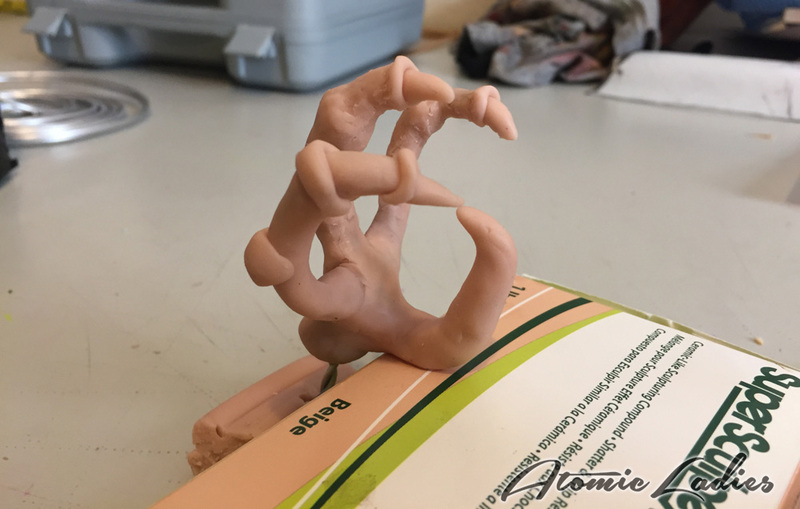 Miliput was used to sculpt the claws and the smaller bone elements. 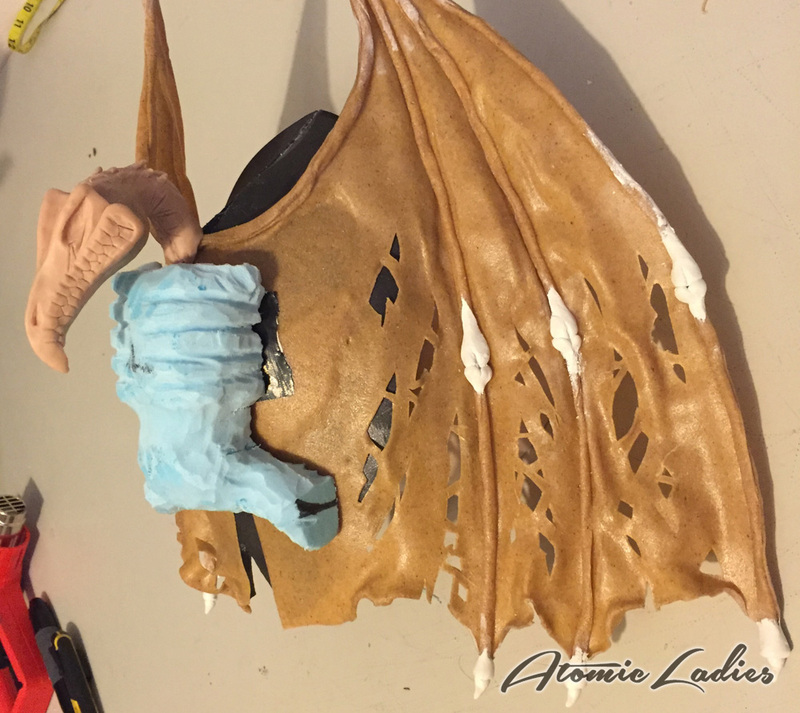 Any 2 part epoxy clay will do for the smaller elements: it will stick solidly to almost anything and dries hard within 24 hours.The wings were then heated one last time and attached to the EVA foam shoulder plate using Contact Cement. 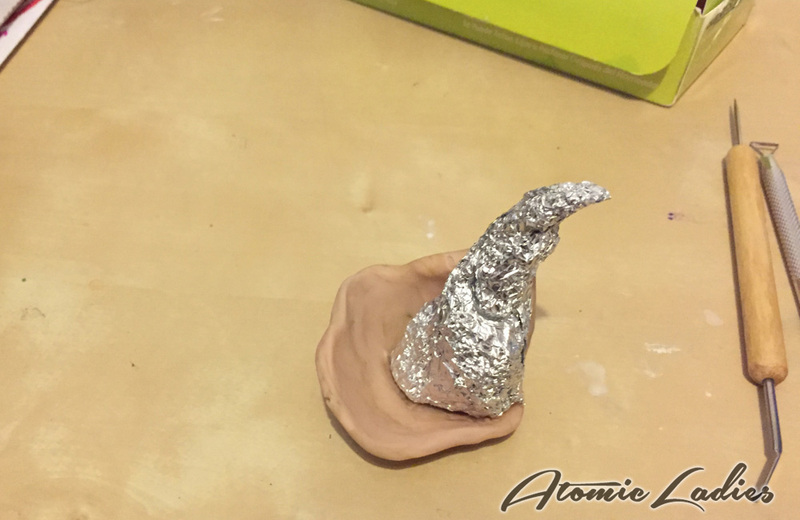 The head is made of Aluminium Foil inner and Super Sculpey outer, this cuts down the weight and the baking time. 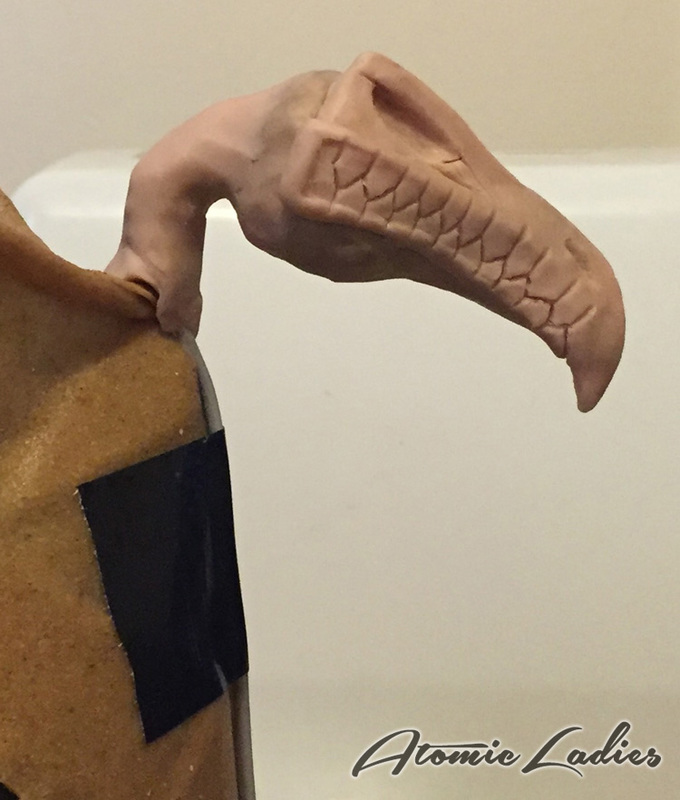 A combination of sculpting tools and hand moulding was used to achieve the final sculpted look. 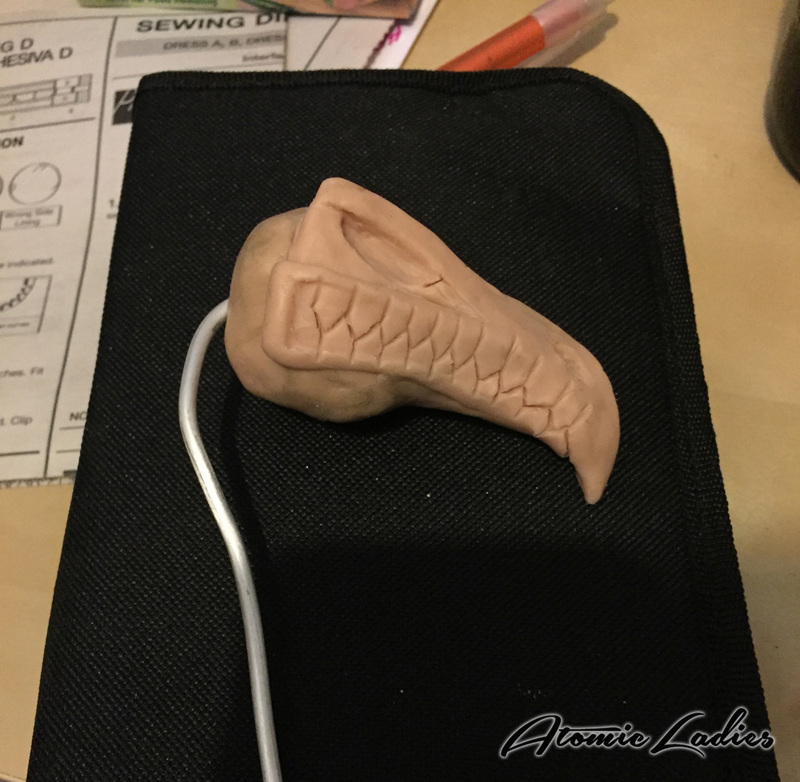 A length of armature wire was pushed into the head at the back, and this formed the core of the neck that was then moulded around the wire and the wings so that it would slot on perfectly. It was then baked hard and attached to the wings with contact cement at the top and Gaffer Tape to stabilise. 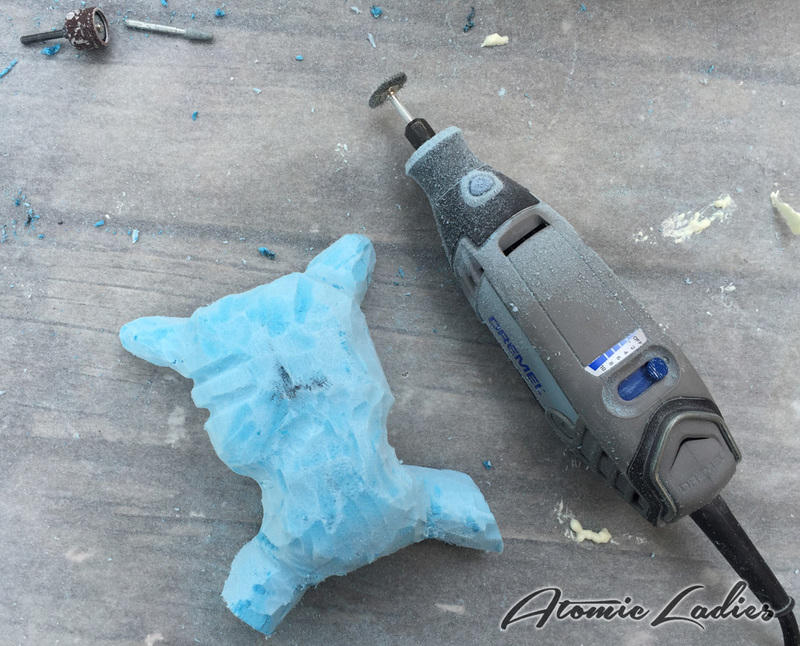 The body was carved out of XPS craft foam, at first using a bread knife for the base shape then a Dremel to finish. 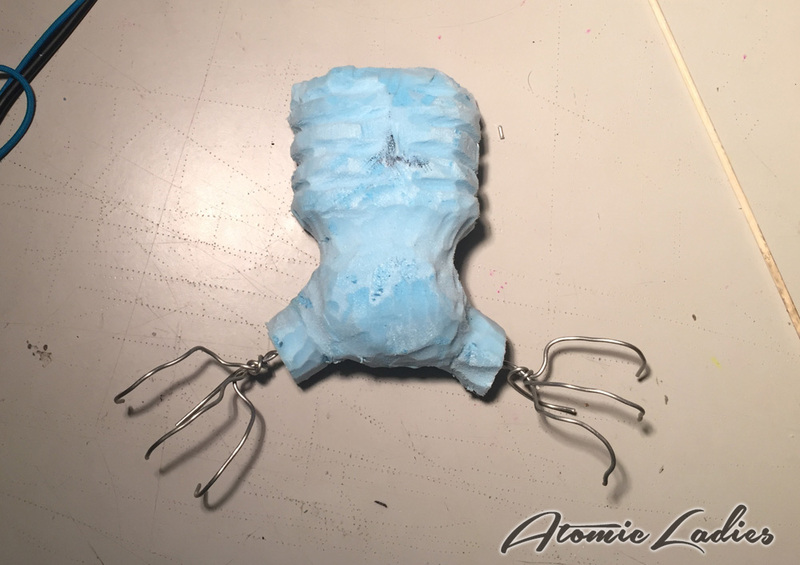 For the feet, armature wire was shaped and fitted into the foam body to make sure sizing was correct. 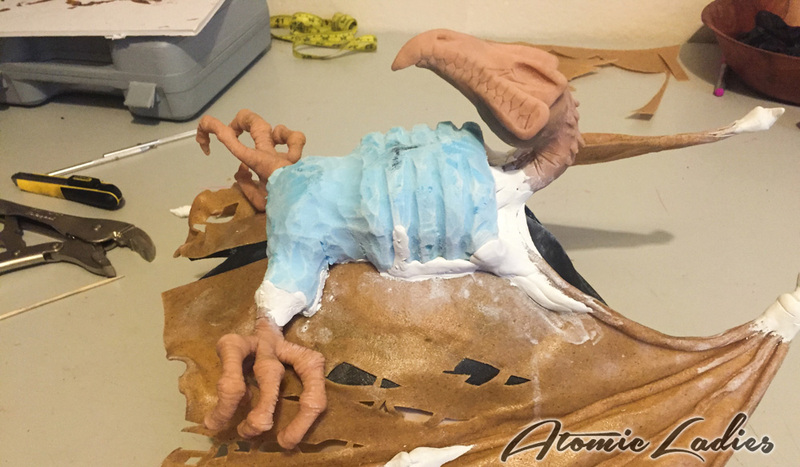 Super Sculpey was then molded around the armature skeleton with sculpting tools used to achieve the final look. The claws were then baked to harden.